1 To learn what a "fakir" is. 2 To understand the feeling of jealousy and how painful and destructive it is. 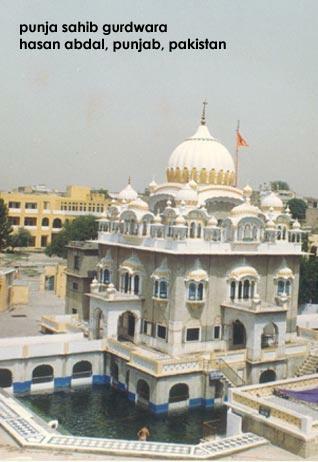 3 To appreciate Punja Sahib and how powerful it is to be in tune with God. Teachers, ask the students to say the Sikh greeting with you; then fold hands and do simran with the students. Those of you who have memorized the Aarti of Guru Nanak may recite it in the sangat next week. A "fakir" is a Muslim who gives up material comforts and family and wanders about, begging for food or money. He sometimes does punishing feats to his body like sleeping on a bed of nails and may perform magic and have miraculous powers. For this reason, he is very much like the Hindu "siddhs" we talked about in the last lesson. The story we are about to read is of a man who pretends to be a fakir. You could say he was "faking" it. Listen carefully because you are going to find out why we say he is faking being a fakir. It is titled "A Haughty Fakir", but a better title might be "A Jealous Fakir". "Haughty" means that a person feels they are better than other people. But you will see that the character trait that drives this man named Wali Qandhari is his jealously of Guru Nanak. It leads him to do two very bad things. Why do you think Wali Qandhari was pretending to be a fakir? You have to go back to the definition to answer this question. (Pause for answers.) Right! A fakir is not supposed to own a home or land. The very word means "poor" or "poverty". It's a badge of honor for a truly holy person because it means that they are more attached to God than to material things. Can you imagine how upset and frightened Wali Qandhari was when the people deserted him and went to listen to Guru Nanak instead? Wali Qandhari was afraid that they would no longer give him food or money. He was very jealous of Guru Nanak's popularity with the people. His mind was in agony. Being jealous causes much mental suffering. People who are jealous can do terrible things to other human beings because the pain they are in makes them lose all their sense of right and wrong. Jealousy is called the "Green-Eyed Monster" because jealous people can behave like monsters. Right! Wali decided to withhold water from the village. Of course, this was a death sentence for all the animals and all the people in the village. Only clean air is more precious than clean water. Without water, we die in a few days. Wali knew this very well. In fact, he was counting on it. He did not care about the people at all. This is another reason why we know how jealous he was and why he was a fake. Since he was a fake, he probably thought that Guru Nanak was a fake as well. Many people who do wrong things try to justify their bad behavior by thinking that other people are doing the same bad things or worse. How did Guru Nanak prove him wrong? (Pause.) Right! By sincerely praying with the people, the water they so desired sprang up from the rock. Wali Qandhari was on the top of the cliff watching the whole scene. He was so surprised, so angry and so jealous of what Guru Nanak had done for the people, he did the second very bad thing. What did he do? (Pause.) Right! He pushed a giant rock over the cliff, hoping to crush Guru Nanak. But what happened then? (Pause.) Right! As the rock hurtled toward him, Guru Nanak did not even turn around. He put his hand up over his head. 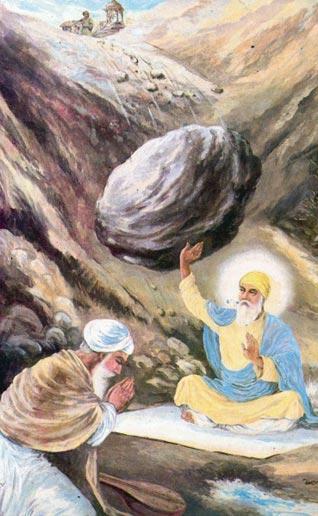 Not only did the rock stop, not only did Guru Nanak not injure his hand, but a print of his hand went into the rock and is still visible at Gurdwara Punja Sahib (which is now in Pakistan today). Guru Nanak performed this miraculous feat with only the love of God and compassion for the human beings who were so thirsty. He did it because he was totally in tune with God and content with what Waheguru wanted for these people. He showed us the true power of love of God and kindness to others and how being in tune with God can change the world. The opposite of jealousy is "contentment" which is "santokh" in Punjabi. Being satisfied with what we have is what contentment means. It is so important for us to learn how to be content, that we truly cannot have happiness in our lives without it. It is just as important for our minds and hearts as clean water is for our body. Write four blessings that you have on a piece of paper. We will share them with our classmates next week. Living Sikhi, Lesson # 29 "